Castle Training Academy, a highly recommended and market leading occupational safety training provider for over 30 years, have announced their next One Day Course for Noise at Work – this time with an interesting twist. 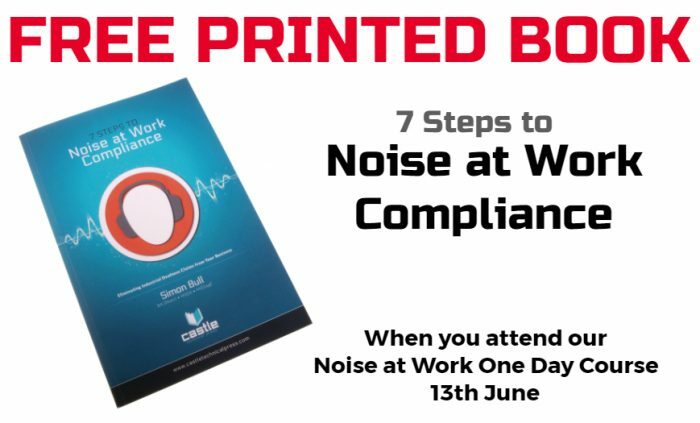 In Birmingham on June 13th, delegates will not only receive a full days professional training in Noise at Work, learning how to easily perform noise assessments and how to prevent claims from arising, but they’ll also receive a free printed book titled 7 Steps to Noise at Work Compliance. “For the first time with this format of training we’re able to give every delegate a copy of our printed Noise at Work book, which outlines how safety managers can ensure their organisation is complying with The Control of Noise at Work Regulations 2005.”. The course is only £300, but if you also book Air Sampling for COSHH on the 12th and Hand Arm Vibration on the 14th, you can come for less than £220 per day. To find out more or book, call 01723 584250 or visit www.castletrainingacademy.com.